The short answer to the question "Is rice gluten-free? ": Absolutely. Rice, the top go-to grain for people who are gluten-intolerant, is naturally gluten-free. Is rice gluten-free? If you're gluten-sensitive, you'll love the answer. Rice is a popular grain that is ubiquitous in the gluten-free diet. And rice flour, both white and brown, is a standard ingredient in most commercial gluten-free baked goods and flour blends. That’s good to know if you have gluten intolerance symptoms. So if you’re asking yourself, “Is rice gluten-free?”—the answer is an emphatic yes. We’ll go even further: Unquestionably, rice is the planet’s most important plant. It’s an ancient food staple for billions. Inexpensive, plentiful, and satiating, it appears in a wide assortment of shapes, sizes and colors and continues to inspire delicious culinary creations. Many of our most popular recipes depend on rice as a main ingredient. That’s not to say rice doesn’t have “issues.” In 2014, Consumer Reports focused national attention on the arsenic levels in rice, which prompted the Food & Drug Administration (FDA) and the Environmental Protection Agency (EPA) to investigate. People in the gluten-free community who consume rice as their principle grain should be aware that there is some level of arsenic in certain types of rice grown in certain parts of the world. Consumers should understand how they can modify their rice consumption to address these concerns. Based on its analysis of arsenic levels in rice, Consumer Reports issued safety guidelines on November 18, 2014. Lundberg Farms is a major producer of organic rice in the United States. Gluten Free & More published an informative interview with CEO Grant Lundberg about arsenic in rice in its June/July 2015 issue. While we’re examining that widely asked question—Is rice gluten-free? —let’s talk about the different types of rice. There are more than 100,000 varieties! Conveniently, most fall into three main categories: long, medium and short-grain rice. Long-grain rice: This is a classification of rice whose body is at least three times as long as it is wide. Long-grain rice generally cooks up light, fluffy and less sticky than other varieties due to higher levels of dry starch amylose. Best in: Savory dishes, salads, stir-fries, pilafs, curries, Indian, Mexican, Caribbean and Thai dishes, stuffing and fried rice. Medium-grain rice: Typically, medium-grain rice is shorter but plumper than its long-grain kin. When cooked, this rice tends to remain moist and tender and sticks together more than long grain but less than short grain. Best in: Paella, risotto, casseroles, rice and beans, stuffing, meatloaf, rice salads, breads and desserts. 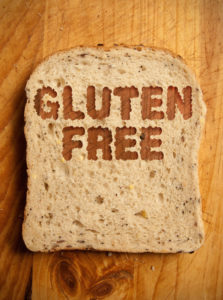 Now that we’ve answered the question, “Is rice gluten-free?” are you ready to chow down on some delicious dishes? There are so many creative ways to use rice in every day cooking from Adzuki Bean Rice Burgers to Chicken Wraps with Coconut Rice, you’ll find tons of tasty recipes at GlutenFreeandMore.com. cooking, diet, food, gluten, gluten free, gluten free baked goods, gluten free diet, gluten free flour, gluten in, gluten intolerance, gluten intolerance symptoms, is rice gluten free, organic, rice gluten, the gluten free diet. I thought you might be interested in this article on https://universityhealthnews.com: Is Rice Gluten-Free?